The utilization of footwear impression evidence continues to evolve with new materials, equipment and techniques, providing an increased ability to detect, record, enhance, and examine this form of evidence. Recently developed technology now allows investigators to more efficiently or, in some cases, instantly link multiple crime scenes where impressions have been produced by the same perpetrator. Forensic Footwear Evidence covers a wide range of relevant topics, including historical references, general information about the formation and investigative use of footwear impressions, and the best practices and considerations that apply to the recovery, enhancement, and examination of this evidence. Drawing on the author’s 44 years of acquired knowledge and experience, it is the most comprehensive and authoritative text published to date on this topic. Highlighted topics covered within the book include Three chapters covering footwear manufacturing Shoe grading, sizing, and the forensic application of sizing information Examination and reporting procedures Casting impressions in snow Barefoot evidence Topics of interest for both prosecution and defense attorneys The book includes more than 300 color photographs and illustrations throughout, as well as case examples that apply theoretical concepts to the real world. 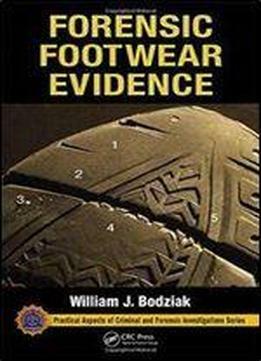 A single, complete reference on the subject, Forensic Footwear Evidence presents a wide range wealth of information that will serve as an invaluable reference to novice and experienced examiners, crime scene technicians, investigators, and prosecution and defense counselors alike.